If you have funds frozen at the company, then I am sad to report that there have been no recent status changes. 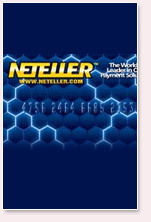 Neteller has come out and said that it is working with the US Attorney Office of New York, and is co-operating with the USAO in the hopes that the two parties will be able to strike an agreement that would allow for the orderly return of funds to US holders. This was over two months ago, and Neteller hasn't said anything since. It is my firm belief that the funds will in fact get returned, and that we hopefully hear something concrete before the summer. In terms of the founders of the company that were arrested in January; the US government asked for, and was granted, a fourth continuance in the case, and the next court date for this case will be May 16th. Insiders in the industry say that each continuance granted to the US government has indicated that they may not have much of a case, and charges may in fact be dropped completely. It appears as though there will be a resolution to each matter sometime during the summer, and we will of course cover every development as it happens.